"Greetings my fellow citizens of Planet Earth. Ah, yes, that was my dream and I carried the Light for it, bright and shining! ** I had risen to the office of President because I knew that I had things to do. "Now, you must know that I was born into a very powerful family which had close ties with the ones you call the illuminati. I chose to come in to this family because I knew that I could be a bridge between the directions that they chose to take the world into -the deep, dark abyss of war, for one, in order to further profit, as if they didn’t already have vast quantities of wealth. And they were engaging already in Vietnam, in Africa and in other places around the Planet and they were calling upon our young men from our country of The United States of America, and indeed from the countries all over the world, to become involved and engaged. "But let me go back to the election because there are rumors, and I wish to acknowledge them. I allowed certain things to take place in order to get elected to the office. And I know there were some pay-offs and bribes, particularly in Chicago and New York City. My family organized and arranged some of this. The unions, almost all of them got out the vote for me. "It was entirely necessary for me to become President in order to not have, what you might call, a runaway train in the directions that the illuminati had already initiated. In other words, as it turned out, I was able to slow that train somewhat! I was able to bring forth great openings of Hearts. Some of you were there. Some of you have seen movies of the anti-war protests - young people marching in the streets, young people, in some cases, giving their lives at home, being wounded because they were met with violence. Some were killed – remember Kent State - some went to prison because they refused to go to war. "All are Profiles in Courage who sacrificed in order that this might reach the vision of the World, in order that the World might start waking up. Yes, there have been other wars and conflicts. There have been atrocities, genocides, false imprisonments, torture, and all of these things that you know about have occurred since I was President, but the seeds, or the foundations, or you might say the candles, were lit. "Candles were lit in the darkness in support of my Mission. And there were other dreams and visions which I carried - I and my brothers, despite the assassinations, even of my own son, who was determined to start telling the Truth in his magazine. But these assassinations served a purpose because there were those who vowed to take up the torch, to keep the candles lit, and to continue the dreams! And so I offer my thanks and gratitude to all who have fallen to uphold and support and further these visions, and to all of those who remained in Earthly bodies, because now is the time for those visions to actually become your reality!!! "I signed executive orders. You all know, most likely, that I signed an order to put us back on the gold standard. What you may not know is that I knew exactly what the IRS was doing with your hard-earned money. They were funneling it into the pockets of the wealthy. I knew the ins and outs of the Federal Reserve System; oh yes, I knew, and I was determined to end those programs, putting us back on the gold standard and encouraging the entire World to come onto it – NESARA had not yet been written, but I knew its principles! "I knew that we were all One and that together we could live this Lifestyle; a Lifestyle of Peace; a Lifestyle of Abundance for all; a Lifestyle where the color of one’s skin or who they worshiped would not make any difference to their neighbors or to the World! All of this, and more, I was determined to bring forward, and yes, I was perhaps a bit overestimating of my abilities to do this, but nevertheless I made in-roads. "There is another matter. You know that I met with President Eisenhower, and you have heard his famous words, to beware of the military industrial complex. He told me of what he knew about Area 51*** and the entire exploration of technologies which had come from those who had visited the Planet, specifically to offer certain inducements to the military to allow them to experiment and look for what they were looking for. "I was curious, I was not afraid. In my youth - and I was relatively young - I did not realize how powerful the military industrial complex had become, even then. But what I did was to bring it into the Light with space exploration missions. In other words, I worked with that concept because it was my vision that, in going into space we would be not only providing a platform of security -for all countries really, but of course, for The United States of America and our neighbors and allies and so on - but we would be getting more knowledge, more information and more contact because I reasoned that, if there was a race or two, a group of ET’s who were somewhat overbearing, there must be millions out there who would be friendly! "It was my desire - now I had some contact, as you know - and it was the Ashtar Command which helped make possible the intervention in which a clone was substituted for the real me so that I did not die on that day in Dallas. My body was not shot and killed. The Ashtar Command welcomed me aboard and I have been with them and I have been watching the progress upon Planet Earth. "I have seen the marchers all over the world, the marchers for Peace. I have found, and been connected with, and consulted with many, many representatives, ambassadors from the planets and stars, and from the civilizations which are more advanced than Planet Earth and are only too willing to share the bounty of their technologies as a part of the Golden Age for Planet Earth! I assure you my fellow citizens, they are so anxious to come and be recognized by all in your World! You have so much on your Path - the Road to the Golden Age is almost clear!!! "And so it is that I tell you that my visions and my dreams and my hopes for the World are coming into being! They are real!!! This phoniness of the programs of the illuminati, that is the unreality! That is unreal because that is not Love, it is not coming from Love, it is not created from Love, and what is real is Peace on Earth, the Brotherhood/Sisterhood of all citizens of your World -all kingdoms, as you say, of humans and everyone else, all the other beings coming together in harmonious Abundance, Peace and Joy!!! "I am pleased that you have come to hear this because I tell you from my Heart to yours that this has always been my vision in my life as John Fitzgerald Kennedy, and together we are bringing this into reality! Thank you my fellow citizens of Planet Earth. I salute you, I honor you, and above all else I love you infinitely and always!!! And so it is. Namaste!" ** Referring to Ashtar's message, heard previously. 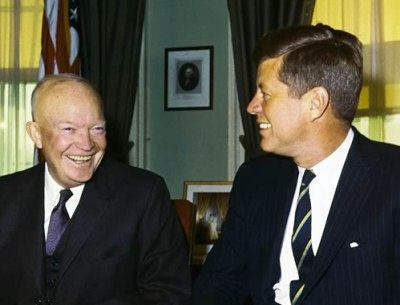 *** Hear how President Eisenhower learned the secrets of Area 51.